Momofuku’s David Chang has a nearly insane work ethic that rivals that of the late great Godfather of Soul. 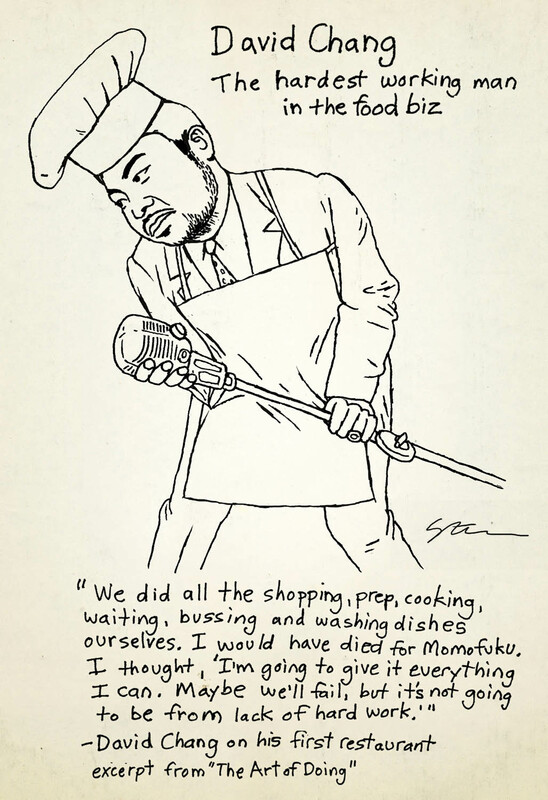 David Chang’s nearly insane work ethic rivals that of the Godfather of Soul. Working his way through some of New York City’s finest restaurant kitchens in his mid-20’s with cooks “as badass as Navy Seals,” Chang told us that he believed he’d never be a great chef—at least not in the classic sense. Instead he had to find his own voice. Every since he’d been a kid he’d been obsessed with noodles. So he quit his high-end kitchen job and went on a noodle quest, apprenticing himself to soba and ramen noodle makers in Japan. When he returned, he opened his first restaurant, Momofuku Noodle Bar, in a tiny space in the East Village no bigger than a one-car garage. His goal was to make a humble bowl of noodle soup made with 4-star chef technique. With little cash and no executive experience, Chang worked himself so hard that he was sure he’d be dead by the time he was 35. Of course, without his culinary brilliance, Chang would not be where he is today with a foodie empire of over a dozen critically-acclaimed restaurants, bakeries and bars scattered around New York, in Australia and Canada—but it is his obsessive work ethic that keeps him going through the hard times and epic near-fails. David Chang Fact: 2000, NYC: Chang wants job so badly at Craft Restaurant under chef Tom Colicchio that he works answering phones for free. After pleading, he’s admitted into kitchen to chop and clean vegetables for no pay and eventually works his way up to cook. Previous Previous post: Are you Negotiation Phobic?